We know that search engine rankings change (a lot). We know that each update moves some sites up in the rankings while others fall from grace. But even though this is old news, Aaron Wall at SEOBook.com frequently rants against algorithm changes that affect large numbers of sites (especially his own) while leaving some other offenders unscathed. Regardless of your opinions, his point is valid. The algorithmic updates sometimes seem to arbitrarily affect some sites more than others with similar characteristics. But, as Google has always said, it’s their algorithm and they can do whatever they want with it. The smart marketer doesn’t rely on rankings alone to determine if their SEO efforts are successful. In fact, I recommend NOT relying on search rankings. Check out this post on the SEO metrics that I feel are more relevant than rankings. 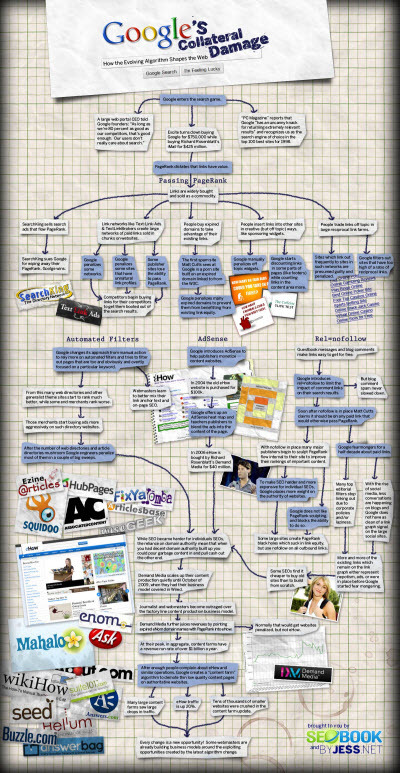 Aaron’s infographic gives an idea of the “collateral damage” caused by Google’s algorithm changes. Again, you may not agree with everything in it (I sure don’t), but it’s a great visual representation of how the algorithm has evolved.